The Amazing Adventures of Spider-Man is a motion-based 3D dark ride located at the Islands of Adventure, Orlando and Universal Studios Japan, Osaka theme parks. Built for Islands of Adventure's opening in 1999, the attraction is a hybrid ride combining special roving motion vehicles with 3D projection, elaborate physical sets, and both practical and tactile effects. The ride takes park guests-turned-last-minute-reporters into the world of Marvel Comics' Spider-Man, and after boarding a Daily Bugle vehicle known as the "Scoop", the rider learns that the evil Sinister Syndicate has captured the Statue of Liberty with an anti-gravity gun. This evil group is made up of many famous Spider-Man villains, including Doctor Octopus, Scream, Electro, Hydro-Man, and the Hobgoblin. The attraction took three years to produce, with many new technologies and techniques being developed. The Amazing Adventures of Spider-Man has been well received, winning several awards including the Golden Ticket Award for Best Dark Ride for twelve consecutive years. On March 27, 1999, Islands of Adventure opened for technical rehearsals, with The Amazing Adventures of Spider-Man being one of its debut attractions. On May 28, 1999, the attraction officially opened to the public. Due to the success of the attraction, Universal Studios Japan opened a clone of the ride on January 23, 2004. On May 19, 2011, Islands of Adventure announced a major refurbishment of the attraction, with plans to re-master the entire ride film in high definition as well as to update the ride's mechanics and to replace the film projectors with Infitec digital projectors. The refurbished version of the attraction debuted on March 8, 2012. The ride was refurbished in time for the release of 2012 film, The Amazing Spider-Man. In 2013, the attraction at Universal Studios Japan underwent a similar refurbishment with 4KHD projections being deployed. The refurbished attraction opened on July 5, 2013. Guests enter the Daily Bugle from Marvel Super Hero Island at Islands of Adventure or New York City at Universal Studios Japan. Guests are shown a video in which the company's good reputation is touted and a new newsgathering vehicle, the "Scoop", is introduced. After walking through the empty office, guests are shown a "live" video feed of news coverage. Five supervillains led by Doctor Octopus have lain siege to the city by an experimental anti-gravity cannon created by Doctor Octopus himself. The syndicate steals the Statue of Liberty and threatens to destroy it if the city does not surrender to them. As guests walk through the empty offices of the Bugle, it becomes apparent that all the reporters have fled, leaving The Bugle's Editor-in-Chief J. Jonah Jameson with no choice but to send the tourists to cover the story using the Bugle's new Scoop vehicle. After donning night vision goggles (3D glasses) the "cub reporters" get in the Scoop and leave the loading docks to a Manhattan back alley where they encounter Spider-Man. He warns that he is in for the most dangerous night of his life and for the guests to be careful. In this scene, a series of synchronized effects are used to simulate Spider-Man jumping on the Scoop. Nearly missing a trash truck driven by a Stan Lee cameo, the guests enter a warehouse where the Sinister Syndicate are holding the Statue of Liberty hostage. Once spotted, Electro, Scream, and Doctor Octopus attack and hurl the Scoop into the sewer, where Spider-Man is waiting. After he fends off Hydro-Man and Doctor Octopus there, the guests escape narrowly to the river where Hobgoblin attacks with his pumpkin bombs and sends guests into the streets. In the ride's climax, Doctor Octopus lifts the Scoop up to a height of 400 feet (120 m) using the anti-gravity cannon. A number of synchronized effects help achieve this without the vehicle leaving the ground. These include a movable building set, lighting cues, simulator movements, projections and wind effects. Spider-Man attempts to pull the Scoop down, but is attacked by all the supervillains. Spider-Man thwarts them, but not before Doctor Octopus disengages the anti-gravity device, sending the Scoop on a simulated freefall until it is rescued by Spider-Man's webbing right above the ground and another Stan Lee cameo. Spider-Man manages to capture all of the supervillains by tying them with webs. As the vehicle pulls into the unload station, Spider-Man thanks the guests for their help and sends them back to the Daily Bugle, where he has rigged the anti-gravity cannon to lift Jameson up to the ceiling in his office. Guests unload while a modern rendition of the classic Spider-Man theme song plays and a voiceover instructs the riders on exiting properly. 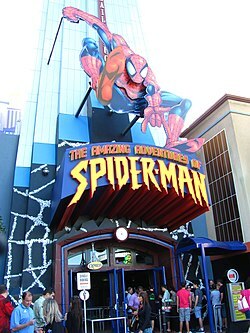 Development of The Amazing Adventures of Spider-Man at Islands of Adventure began in 1996. Allen Ambrosini from At The Park Magazine stated theme park guests in the late 1990s were becoming more sophisticated, desiring rides that combined theming and thrills into a single immersive experience. As a result, the ride's creators set out to develop a ride which would take the motion simulation elements of Back to the Future: The Ride, and combine them with a 3D film similar to that used on T2 3-D: Battle Across Time. The result was a prototype ride system combining a track-mounted motion base vehicle with 3D projections and other special effects, with the aim of immersing guests inside a comic book. To develop the attraction, Universal Creative brought together a number of companies including the Oceaneering Entertainment Systems division of Oceaneering International, Birket Engineering, Moog, Soundelux, Kleizer Walczak, and Rinehart Manufacturing. The ride system used on The Amazing Adventures of Spider-Man was originally prototyped for the attraction at Islands of Adventure, before being installed at Universal Studios Japan. It has since been utilized for Transformers: The Ride at Universal Studios Singapore, Universal Studios Hollywood and Universal Studios Florida. The ride vehicles, developed by Oceaneering International, are mounted to a track-roaming platform that provides the forward motion to move the vehicle through each show scene. The yaw motor and a stewart platform with six degrees of freedom attaching it to the platform allows the vehicle to move 360 degrees at different angles along the track. The track switches were manufactured by Dynamic Structures. Each of the vehicles designed by Thierry Coup are themed as the Daily Bugle's new "Scoop" vehicle for reporters, with each accommodating twelve riders. Each row of four riders is restrained by a single lap bar. This system was invented by Universal Creative employees Philip Hettema, William Mason, and Gary Goddard. A similar system has been patented by Oceaneering International and used on rides such as The Curse of DarKastle at Busch Gardens Williamsburg, Tokyo Panic Cruise at Tokyo Dome, and Speed of Magic at Ferrari World Abu Dhabi. The Amazing Adventures of Spider-Man was primarily developed by Universal Creative, the research and development division of Universal Parks & Resorts. Scott Trowbridge, who now works for Walt Disney Imagineering, was the ride's producer. Thierry Coup, who has since worked on Harry Potter and the Forbidden Journey and Transformers: The Ride, was the Director and production designer. Trowbridge and Coup helped develop the initial storyboards for the attraction. They travelled to Massachusetts several times to meet with the animation directors, Jeff Kleiser and Diana Walczak, and their team at Kleiser-Walczak Construction Co. (now Synthespian Studios) who provided all the stereoscopic animation and custom software for squinching. Coup produced the film alongside Patrick Mooney and Mark Rhodes. Scott Trowbridge and Thierry Coup are given writing credits alongside Ross Osterman and Scott Peterson. Peter Lehman provided the soundtrack with Soundelux. The attraction features thirteen 30-foot-tall (9.1 m) projection screens, twelve of which use 3D projection. The ride uses a polarized 3D system where the two projectors have polarizers designed to interact with each lens of the 3D glasses. By blocking light from one projector with each lens, the 3D effect is achieved. With traditional 3D projections there is an ideal seating location, where an off-center viewing location reduces the overall effect of the 3D. To allow the ride to effectively combine 3D projections with moving viewers, Kleiser-Walczak and their head of software, Frank Vtiz, developed a process they called squinching. First, the amount of distortion is predicted from a particular viewing angle. This same amount of distortion is then added in the opposite direction in order to counteract the effects. Initially miniature models were used to determine the ride's path and the vehicle's point of view, with full-scale prototypes being used later. Trowbridge and Thierry Coup are credited with inventing the concept of squinching, with Universal Studios holding a patent for the method. In addition to the ride's motion base and 3D projections, special effects including fog machines, fire, wind, heat, mist, strobe lights, and water spray are also employed throughout the attraction. All of these effects, along with the ride system, 3D projections and soundtrack, are controlled by a central industrial control system which knows, to one thirtieth of a second, when they are to execute. Just shy of the ride's debut, the director of show and ride engineering at Islands of Adventure, Steve Blum, described The Amazing Adventures of Spider-Man as the "most technically complex of all of the attractions" at the park. Vice president of design and creative development Mark Woodbury stated that they "would not have been able to tell this particular story if it weren't for the technical tools". Cited by many as one of the best amusement rides in the world, The Amazing Adventures of Spider-Man has been well received. Howard Shapiro of The Philadelphia Inquirer stated the ride was "bound to become one of the all-time attractions of theme parks anywhere". He described the climax of the ride the "most amazing effect". Bill Dean of The Ledger described the ride as the "most impressive" attraction at Islands of Adventure. Guests interviewed by Dean praised the ride with comments including "I loved it", "I think this is better [than Back to the Future: The Ride] because of the 3-D effects", and "it was so exciting and everything was happening all at once, so it was really, really good". Fred Mawer of the Daily Mail described the rides at Islands of Adventure "as technologically sophisticated as any in the world" with The Amazing Adventures of Spider-Man being "the most extraordinary few minutes". Arthur Levine of About.com gave the ride 5 stars describing the ride as "an incredibly sophisticated attraction" that "blurs the line between virtual and reality so well that you'll emerge slack-jawed and awe-struck". He stated the enhancements made to the film projections in 2012 and 2013 "make the attraction even more immersive and awe-inspiring". Brady MacDonald of the Los Angeles Times rated the ride his second favorite in the world, after Disneyland's Indiana Jones Adventure. Following the opening of fellow Universal rides Harry Potter and the Forbidden Journey and Transformers: The Ride in 2010 and 2012, MacDonald bumped The Amazing Adventures of Spider-Man to his fourth favorite. In an interview for Amusement Business, Mark Hansen Jr. of Theme Park Critic praised the ride in stating that their dream ride would combine The Amazing Adventures of Spider-Man with a 4th Dimension roller coaster such as X at Six Flags Magic Mountain. Theme Park Insider rated the ride a 9 out of 10, based on 250 reviews. In April 2004, just three months after the ride opened at Universal Studios Japan, Amusement Business reported the park was "benefiting greatly from the addition of the ride". Figures released at the end of 2004 showed Universal Studios Japan's attendance rose from 8.8 million people in 2003 to 9.9 million people in 2004, ranking it the sixth most visited park worldwide. The Amazing Adventures of Spider-Man has been the recipient of many awards from the amusement park industry. It won Amusement Today's Golden Ticket Award for Best Dark Ride for twelve consecutive years from 1999 through to 2010. It has since placed second in that category, after fellow Islands of Adventure attraction, Harry Potter and the Forbidden Journey, took the top spot in 2011. In 2000, the ride won a Thea Award from the Themed Entertainment Association for outstanding themed entertainment and experience design. It has also won numerous public-voted Theme Park Insider Awards and Screamscape Ultimate Awards. ^ "Universal To Offer Soft Opening For Islands Of Adventure" (Press release). Islands of Adventure. March 23, 1999. Retrieved June 23, 2013. ^ a b "The Amazing Adventures of Spiderman (Islands of Adventure)". Parkz. Retrieved June 23, 2013. ^ a b "The Amazing Adventures of Spiderman (Universal Studios Japan)". Parkz. Retrieved June 23, 2013. ^ MacDonald, Brady (May 19, 2011). "Universal Studios Orlando plans 'Despicable Me' attraction and digital upgrade to Spider-Man ride in 2012". Los Angeles Times. Tribune Company. ^ Kubersky, Seth (March 10, 2012). "Universal's Spider-Man Ride Repoens In Hi-Def". Orlando Weekly. Retrieved December 29, 2013. ^ Bevil, Dewayne (March 1, 2012). "Islands of Adventure: Spider-Man ride to reopen March 8". Orlando Sentinel. ^ "NEW アメージング・アドベンチャー・オブ・スパイダーマン・ザ・ライド 4K3D" (in Japanese). Universal Studios Japan. 2013. Archived from the original on June 23, 2013. Retrieved June 23, 2013. ^ "New The Amazing Adventures of Spider-Man - The Ride 4K3D" (PDF) (Press release). Universal Studios Japan. March 12, 2013. Retrieved December 29, 2013. ^ a b "Super Hero Island is Marvel". Amusement Business. 111 (14): 18–19. April 5, 1999. ^ "The Amazing Adventures of Spider-Man full queue cartoon". YouTube. June 30, 2012. Retrieved June 25, 2013. ^ a b c d e f g h i Total Immersion: Theme Park for the 21st Century. Orlando, Florida: USA Network. ^ a b c "Enhanced Amazing Adventures of Spider-Man on-ride HD POV Universal Studios Islands of Adventure". Coaster Force. YouTube. March 8, 2012. Retrieved June 26, 2013. ^ a b c d e f g h i Extreme Rides. Orlando, Florida: Sky Travel. ^ a b Futrell, Jim (May 17, 1999). "Thrill covergence makes a name". Amusement Business. 111 (20): 29–31. ^ a b "Transformers The Ride". Park World Magazine. Datateam Business Media Limited. December 23, 2011. Archived from the original on September 21, 2013. Retrieved March 14, 2013. ^ O'Brien, Tim (January 11, 1999). "Themed Areas, Coasters In Parks' Capital Plans". Amusement Business. 111 (2): 1, 19–21, 24. ^ Bevil, Dewayne (March 8, 2013). "Spider-Man up and spinning again, this time in high-def". Orlando Sentinel. Tribune Company. Retrieved March 13, 2013. ^ "Universal Studios Japan". The New York Times. The New York Times Company. Archived from the original on June 15, 2012. Retrieved March 13, 2013. ^ a b c MacDonald, Brady (April 23, 2012). "Review: Transformers ride at Universal Studios Hollywood". Los Angeles Times. Tribune Company. Retrieved April 24, 2012. ^ "Portfolio". Dynamic Attractions. Archived from the original on February 25, 2015. Retrieved August 3, 2014. ^ a b Levine, Arthur. "The Amazing Adventures of Spider-Man". About.com. New York Times Company. Retrieved June 26, 2013. ^ "Oceaneering Entertainment Systems" (PDF). Oceaneering International. August 2009. Retrieved June 23, 2013. ^ "Ferrari World Abu Dhabi". Park World Magazine. Datateam Business Media Limited. December 5, 2010. Archived from the original on October 29, 2013. Retrieved June 23, 2013. ^ Powers, Scott (October 22, 2007). "Trowbridge joins Walt Disney Imagineering". Orlando Sentinel. Tribune Company. Archived from the original on November 6, 2012. Retrieved June 23, 2013. ^ a b c d e Johnson, David (November 1, 1999). "Web Masters". Retrieved September 14, 2009. ^ "Getting to know: Thierry Coup". Universal Studios Singapore. Resorts World Sentosa. October 5, 2011. Retrieved June 23, 2013. ^ The Amazing Adventures of Spider-Man: Documentary. Orlando, Florida: Kleiser-Walczak Construction Company. 1999. ^ Brigante, Ricky (March 8, 2012). "'Spider-Man' ride reopens at Universal Orlando with high-flying, high-definition enhancements". Inside the Magic. Retrieved July 2, 2013. ^ O'Brien, Tim (April 26, 1999). "Technology Just Part Of The Story". Amusement Business. 111 (17): 38–39. ^ "Disney-Marvel deal to shake up theme parks". The Washington Times. September 7, 2009. Retrieved June 25, 2013. ^ Shapiro, Howard (July 25, 1999). "Universal Fun Florida's Newest Theme Park, Universal Studios Islands Of Adventure, Is An Intoxicating, Thrilling, Frightening, Exciting And Just Plain Entertaining World Of Legendary Characters And Dizzying Rides". The Philadelphia Inquirer. Philadelphia Media Network. Retrieved June 25, 2013. ^ a b Dean, Bill (May 21, 1999). "Technological Thrills". The Ledger. Halifax Media Group. Retrieved June 25, 2013. ^ Mawer, Fred (May 21, 2002). "Orlando in just four days". Daily Mail. Associated Newspapers Ltd. Retrieved June 25, 2013. ^ Emmons, Natasha (April 15, 2002). "Park fan site operators weigh in on specifics of their 'dream ride'". Amusement Business. 114 (15): 6. ^ Niles, Robert. "The Amazing Adventures of Spider-Man reviews". Theme Park Insider. Retrieved June 25, 2013. ^ Zoltak, James (April 12, 2004). "China Market Is Heating Up; South Korea Doubles Since '99". Amusement Business. 116 (15): 7. ^ Zoltak, James (December 2004). "Lots of walks in the parks the past year". Amusement Business. 116 (29): 6, 13. ^ Baldwin, Tim (September 2011). "Universal's IOA beats itself in Best Rides categories" (PDF). Amusement Today: 21, 22, 26. Archived from the original (PDF) on October 19, 2013. ^ "Thea Awards". Themed Entertainment Association. Archived from the original on August 6, 2013. Retrieved June 25, 2013. ^ a b Emmons, Natasha (September 25, 2000). "Spider-Man and Titanic attractions take home Thea Awards from TEA". Amusement Business. 112 (39): 14. ^ a b Hart, Lance (December 27, 1999). "1999 Screamscape Ultimate Awards". Screamscape. Archived from the original on August 19, 2000. Retrieved June 25, 2013. ^ a b c d e Niles, Robert. "The Theme Park Insider Awards". Theme Park Insider. Retrieved June 25, 2013. ^ "Park and ride winners" (PDF). Amusement Today. September 1999. Archived from the original (PDF) on October 19, 2013. ^ "Park and ride winners" (PDF). Amusement Today. September 2000. Archived from the original (PDF) on October 19, 2013. ^ Hart, Lance (March 29, 2001). "The 2000 Ultimate Awards". Screamscape. Retrieved June 25, 2013. ^ "Park and ride winners" (PDF). Amusement Today. August 2001. Archived from the original (PDF) on October 19, 2013. ^ Hart, Lance (September 18, 2002). "The 2001 Ultimate Awards". Screamscape. Retrieved June 25, 2013. ^ "Park and ride winners" (PDF). Amusement Today. September 2002. Archived from the original (PDF) on October 19, 2013. ^ Hart, Lance (July 16, 2003). "The 2002 Ultimate Awards". Screamscape. Retrieved June 25, 2013. ^ "Three-year format awards" (PDF). Amusement Today. September 2003. Archived from the original (PDF) on October 19, 2013. ^ Hart, Lance (July 17, 2004). "The 2003 Ultimate Awards". Screamscape. Retrieved June 25, 2013. ^ "Park and ride winners" (PDF). Amusement Today. September 2004. Archived from the original (PDF) on April 3, 2007. ^ "Park and ride winners" (PDF). Amusement Today. September 2005. Archived from the original (PDF) on October 19, 2013. ^ "Park and ride winners" (PDF). Amusement Today. September 2006. Archived from the original (PDF) on May 5, 2013. ^ "Park and ride winners" (PDF). Amusement Today. September 2007. Archived from the original (PDF) on September 21, 2013. ^ "Park and ride winners" (PDF). Amusement Today. September 2008. Archived from the original (PDF) on October 19, 2013. ^ "Park and ride winners" (PDF). Amusement Today. September 2009. Archived from the original (PDF) on October 19, 2013. ^ "Park and ride winners" (PDF). Amusement Today. September 2010. Archived from the original (PDF) on September 21, 2013. ^ "Park and ride winners" (PDF). Amusement Today. 15 (6.2): 4, 5. September 2011. Archived from the original (PDF) on October 19, 2013. ^ "Park and ride winners" (PDF). Amusement Today. 16 (6.2): 4, 5. September 2012. Archived from the original (PDF) on October 19, 2013. ^ "Park and ride winners" (PDF). Amusement Today. 17 (6.2): 4, 5. September 2013. Archived from the original (PDF) on October 19, 2013. ^ "Park and ride winners" (PDF). Amusement Today. 18 (6.2): 4, 5. September 2014. Wikimedia Commons has media related to The Amazing Adventures of Spider-Man. This page was last edited on 30 March 2019, at 21:29 (UTC).